Our first ECG simulator replicates paper ECG tracing with multiple choice question and answers. Answers are immediately reviewed and interpretation advice is provided along with the correct answer. With our ECG simulation quiz users are given twenty tracings to analyze without immediate feedback. At the end of the quiz, each tracing is scored and the user score is compared to mean and top scores for all recent website visitors. A fully graded answer sheet is available. Our large ECG tracing repository allows this quiz to be repeated multiple times. 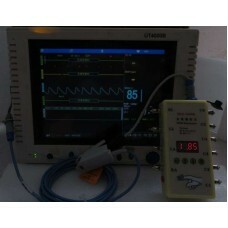 The ECG Patient Monitor is intended to replicate a patient monitor. Users are asked to evaluate twenty live tracings. Complete scoring and an answer sheet becomes available after the quiz is completed.